Top 50 Facts About Antibacterial Drugs | Rapid Revision Sheet! Antibacterial agents are broad and diverse class of drugs – a class that often poses a challenge to the student. 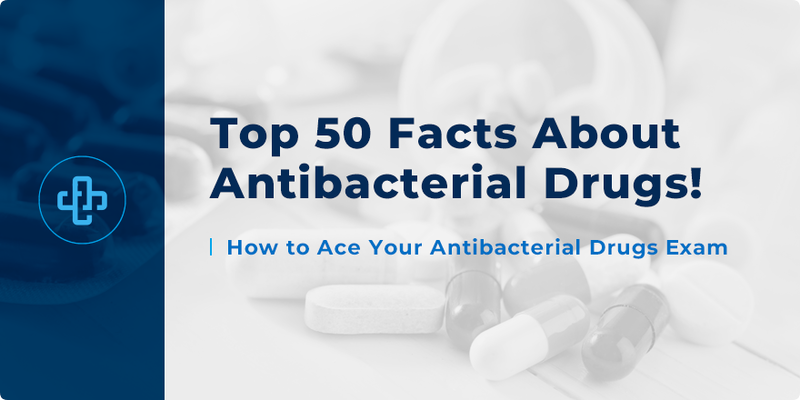 For this reason, we’ve gone ahead and harvested 50 of the most fundamental facts about antibacterial drugs that every student of pharmacy, medicine and nursing should know. We talk about the various drug classes – their mechanism of action, prominent side effects and drug interactions, and a variety of other clinical pharmacology facts that come up time and time again. Tetracyclines work as protein synthesis inhibitors – binding to the 30S ribosomal subunit to prevent tRNA binding to messenger RNA – thereby preventing the addition of new amino acids to the polypeptide chain. Side effects with tetracyclines include photosensitivity, esophageal irritation and tooth discoloration / hypoplasia of dental enamel. Tetracyclines bind to divalent ions, such as magnesium and calcium ions. For this reason, tetracyclines should not be taken within 2 hours of calcium, antacids or iron supplementation. Antibacterial drugs enhance the anticoagulant effect of warfarin by lasting waste to colonic gut flora that ordinarily synthesise vitamin K.
Nitrofurantoin is used in the treatment of urinary tract infections; a drug which, in its reduced form as nitrofuran reductase, works by damaging bacterial DNA to cause cell death (a bactericidal effect). Side effects with nitrofurantoin include gastrointestinal upset, urine that is discoloured a dark yellow/brown hue and hypersensitivity reactions. It has the capacity to cause pulmonary reactions, such as pneumocystis, as well as causing peripheral neuropathy. Macrolides – whose members include clarithromycin and erythromycin – work as protein synthesis inhibitors – binding to the 50S subunit of the bacterial ribosome and blocking translocation (preventing elongation of the polypeptide chain). Side effects with macrolides include nausea, vomiting, abdominal pain and colitis. Other effects include cholestatic jaundice, QT prolongation and – at higher doses – ototoxicity. Macrolides should be used with caution with drugs that prolong the QT interval – such as amiodarone, SSRIs, antipsychotics and fluoroquinolones – as it increases the risk of arrhythmias. Macrolides increase the risk of bleeding with warfarin and increase the risk of myopathies with statins. Gastrointestinal side effects are more common with erythromycin because it is also a motilin agonist; meaning it has a gastroprokinetic effect. Aminoglycosides – whose members include gentamicin and tobramycin – are effective against Gram-negative aerobes (including Pseudomonas aeruginosa). Aminoglycosides work by binding irreversibly to the 30S subunit of bacterial ribosomes – inhibiting protein synthesis. They are bactericidal in effect. As aminoglycosides enter microbes via oxygen-dependent processes, they are ineffective against anaerobic organisms. Side effects with aminoglycosides include nephrotoxicity and ototoxicity. Ototoxicity risk of aminoglycosides increases when taken with loop diuretics or vancomycin. Risk of nephrotoxicity increases when taken with cephalosporins, ciclosporin, platinum chemotherapy or vancomycin. Because aminoglycosides are highly polarised, they cannot cross lipid membranes and so cannot be administered orally. They must be administered via the parenteral route. Drugs that work as cell wall synthesis inhibitors include penicillins, cephalosporins, glycopeptides (for example – vancomycin) and carbapenems (for example – imipenem). Imipenem is always co-administered alongside cilastatin. Cilastatin is used to prevent the degradation of imipenem by the renal enzyme dehydropeptidase 1. Penicillins work by inhibiting enzymes involved in peptidoglycan cross-linkage – weakening the cell wall and preventing the maintenance of an osmotic gradient. The beta-lactam ring is a fundamental structural component of penicillins that accounts for their therapeutic activity. Beta-lactamase is an enzyme produced by bacteria that destroys the beta-lactam ring of penicillins. Beta-lactamase inhibitors are used to prevent this damage. Clavulanic acid is taken with amoxicillin or ticarcillin. Sulbactam is taken with ampicillin or the cephalosporin, cefoperazone. Tazobactam is taken with the antipseudomonal piperacillin. Penicillins reduce the renal elimination of methotrexate, increasing the risk of its toxicity. Fluoroquinolones – whose members include ciprofloxacin and levofloxacin – work as DNA synthesis inhibitors. They inhibit DNA gyrase or the topoisomerase II or IV enzyme – inhibiting DNA replication and transcription. Later fluoroquinolones – such as levofloxacin and moxifloxacin – are more selective for the topoisomerase IV enzyme. Fluoroquinolones are particularly effective against aerobic, Gram-negative organisms. Fluoroquinolones should be used with caution in those who are developing (due to the risk of arthropathy), in those at risk of seizures or in cases where risk factors exist for QT prolongation (for example – electrolyte imbalance or cardiovascular disease). Prednisolone increases the risk of tendon rupture with quinolones. NSAIDs increase the risk of seizures. Drugs that prolong the QT interval – antipsychotics, SSRIs, amiodarone, macrolides etc. – should be used with caution. Ciprofloxacin is effective against Pseudomonas aeruginosa, whereas moxifloxacin and levofloxacin are not. As a rule – earlier cephalosporin generations have greater activity against Gram-positive organisms than later generations. Similarly, later cephalosporin generations have greater Gram-negative coverage than earlier generations. Fourth generation drugs – such as cefepime – have extended spectrum coverage, with similar Gram-positive coverage as first-generation drugs. As with penicillins, cephalosporins work as cell wall synthesis inhibitors. They also contain a beta-lactam ring that prevents peptidoglycan cross-linkage and therefore causes a disruption in the osmotic gradient – leading to cell lysis and death. Cephalosporins do not have activity against LAME organisms – Listeria, Atypicals (such as Mycoplasma and Chlamydia), MRSA and Enterococci. However, fifth-generation drugs – such as ceftobiprole – are an exception as they do have activity against MRSA. Cefoperazone is a third-generation cephalosporin which, unlike other third-generation drugs, has activity against Pseudomonas aeruginosa. Cefoperazone is combined with the beta-lactamase inhibitor, sulbactam. Ceftazidime is also effective against aeruginosa. Vancomycin works by inhibiting cell wall synthesis of Gram-positive organisms. It belongs to the glycopeptide class of antibacterial drugs. Teicoplanin also belongs to this drug class. Side effects with vancomycin include thrombophlebitis, red man syndrome (upper body rash), nephrotoxicity and ototoxicity. Risk of nephrotoxicity and ototoxicity increases when vancomycin is taken alongside aminoglycosides, loop diuretics or ciclosporin. Linezolid is a protein synthesis inhibitor used to treat serious Gram-positive infections. Linezolid belongs to the oxazolidinone class of antibacterial drugs. Side effects with linezolid include headache, diarrhea, rash and nausea. As it is a weak MAO inhibitor, linezolid increases the risk of serotonin syndrome. It can also cause high lactate levels, bone marrow suppression and nerve damage, including optic nerve damage. Trimethoprim is used in the treatment of urinary tract infections. It may also be combined with sulfamethoxazole (Co-Trimoxazole) to treat Pneumocystis pneumonia in patients with HIV/AIDS. Side effects with trimethoprim include nausea, taste disturbances, hyperkalemia and hematological disorders – such as megaloblastic anemia – because trimethoprim works as a folate antagonist. Taking trimethoprim with ACE inhibitors, potassium supplements or aldosterone antagonists (for example – spironolactone) increases the risk of hyperkalemia. Taking trimethoprim with other folate antagonists – such as phenytoin or methotrexate – increases the risk of hematological adverse effects. The PRIEST drugs are used to treat tuberculosis – Pyrazinamide, Rifampicin, Isoniazid, Ethambutol and Streptomycin; medicines which are taken in combination, often for 6 months or longer, to eliminate the infection from the body. Ethambutol is linked to red-green color blindness, optic neuritis and kidney damage. Isoniazid is linked to peripheral neuropathy and hepatotoxicity. Rifampicin causes red-orange sweat, urine and tears – and it, too, is also linked to hepatotoxicity. Clofazimine, dapsone and rifampicin are antibacterial drugs used to treat leprosy. Clofazimine is known to discolor skin a brown-pink color – which may last for many months post-treatment. Dapsone is known to cause agranulocytosis and hemolysis. A small number of patients’ experience liver inflammation. Metronidazole is used to treat infections caused by anaerobic organisms. It works by producing a nitroso free radical that binds to DNA and causes its degradation and cell death. Metronidazole has adverse effects which include metallic taste, disulfiram-like reaction when taken with alcohol and gastrointestinal upset. When used at high-doses for prolonged periods, metronidazole is linked to neurological effects such as peripheral / optic neuropathies, seizures and encephalopathy. Fusidic acid is used in creams / ointments for the topical treatment of Gram-positive infections. Fusidic acid works as a protein synthesis inhibitor – preventing turnover of elongation factor G from the ribosome. It is bacteriostatic in effect. Mupirocin is a topical antibacterial drug used to treat skin infections such as impetigo or folliculitis. It should not be used for more than 10 days. Mupirocin works as a protein synthesis inhibitor through its binding to isoleucyl-tRNA synthetase in Gram-positive organisms. Fosfomycin is used in the treatment of urinary tract infections. It is bactericidal and has broad-spectrum activity. Fosfomycin works by inhibiting cell wall synthesis – specifically by inactivating the MurA enzyme (UDP-N-acetylglucosamine-3-enolpyruvyltransferase) – the enzyme needed to catalyse peptidoglycan synthesis. Know them all? If you’ve an exam upcoming, now is the time to commit all fifty to memory. It’ll make an enormous difference to your pharmacology exam result! For even more facts about antibacterial drugs, take a few moments to become a registered member of PharmaFactz – there, you can receive instant access to thousands more facts to help you master the science of medicines. Check back to our pharmacy blog soon for even more great facts!